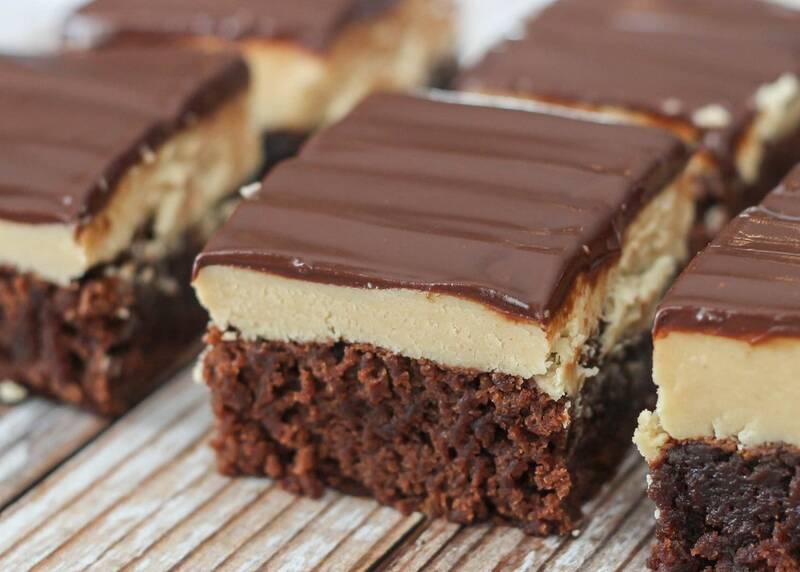 These Buckeye Brownies have 3 layers of goodness with a brownie base, a peanut butter fudge center and chocolate top. They’re the perfect dessert for the chocolate and peanut butter lover. Do you like brownies? It’s one of our “go-to” recipes if we’re looking for a quick and yummy treat. I always have the ingredients on hand, and since we always have ice cream we have an instant delicious dessert, which is nice since we’ve been trying to make friends and invite more people over for dinner and/or dessert. I thought it would be fun to change things up and wanted to try a new brownie recipe from Gooseberry Patch. 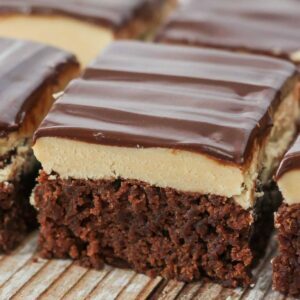 If you’re a fan of brownies, and especially chocolate and peanut butter, these Buckeye Brownies are ones to try. I know these are a new favorite because the hubby isn’t a huge fan of brownies, but he LOVED this version. 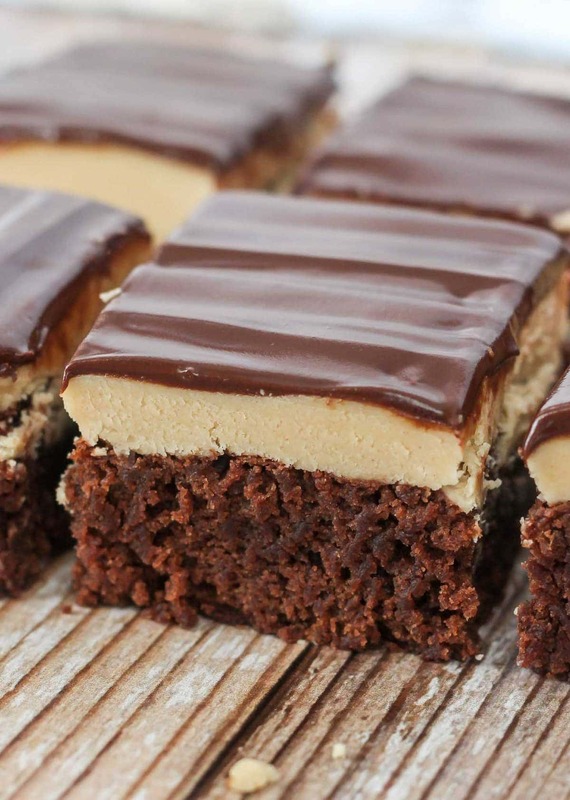 With a brownie base, peanut butter fudge center and chocolate top, they’re hard not to love! So, why are they called Buckeyes? Why are they called Buckeyes? Buckeyes are a confection made from a peanut butter fudge partially dipped in chocolate to leave a circle of peanut butter visible. This is a brownie version because it uses the same kind of peanut butter fudge in the middle and is also topped with chocolate. Adding the layer of brownie on the bottom make them even more irresistible!! These Buckeye Brownies have 3 layers of goodness with a brownie base, a peanut butter fudge center and chocolate top. 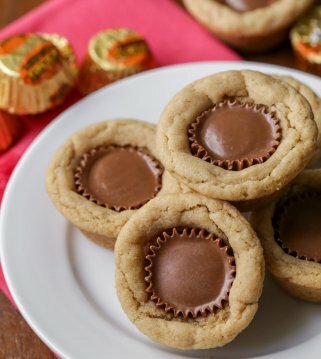 They're the perfect dessert for the chocolate and peanut butter lover. In a 9x13 pan, make and bake brownie mix according to box directions. Let cool. In a bowl add your powdered sugar, ½ cup butter and peanut butter. Mix well. Spread with fingers over the brownies and pat down (it has a consistency similar to playdough). Melt together chocolate chips and remaining butter in a saucepan over low heat, stirring occasionally. Spread over brownies 2nd layer. Let cool and ENJOY! Oh my goodness- my family would freak over these!! I would die for these!!! OMG. What does it mean by “when your hour is just about up” in the Buckeye Brownies recipe? 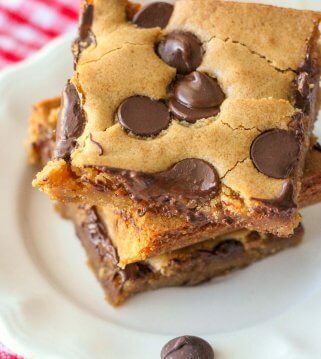 These Buckeye Brownies look SO delicious! 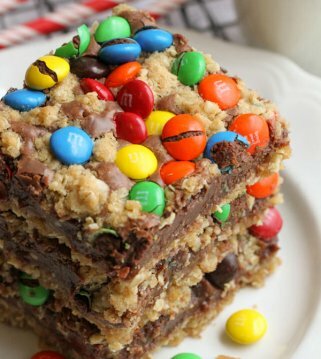 I may just make these this weekend. I know these would be a big hit in our house! Just pinned them! Visiting from the Link Party Palooza! LOVE these! I have them on my “must make” list. Thanks for hosting the party as well – I shared my Roasted Chicken with Clementines. Thank you! I have to try this! I’m drooling! They all look so delicious. YUM! These all look so good. I don’t crave brownies very often, but when I do I want to eat the whole pan. You may have inspired that craving again ;o) pinned. Oh my! They look so good, can’t wait to try them! Hey there! I just made these tonight – a double batch in my big lasagna pan. Oooooooh my. Quite honestly the best dessert I have made in forever! There are going to be some very happy people at our after-church luncheon tomorrow! I used Reynolds Non-Stick foil and Pam and removed the whole slab of brownies from the pan after they cooled completely and then added the peanut butter buttercream and chocolate layers so that I would be able to cut the brownies into smaller squares than, I’m sure, the kids at the luncheon would have! :o) A little of these goes a long way – very, very good! Thanks for an amazing recipe! Could you use semi sweet chocolate chips or does it need to be milk chocolate? These look amazing! Wondering.. the list of ingred. lists 1/2 cup butter..
then it reads : add the 1/2 cup butter to p-sugar & so on. then : add ‘remaining’ butter to melted choc chips..
was there a typo ??? Wondering the same thing… 6tbsp of butter is neither 1/2 cup nor 1/2 stick..
Ohhh nevermind, I just saw my error! These are so amazing!! I made them for a family get together and they were devoured in minutes. Making them now for my husband fantasy football draft party 🙂 thanks for the recipe. You’re welcome. I love to hear that a recipe is a hit. Have a great week!! Made 10 different brownies for a party. These were the favorite! They were also able to stand the heat during a summer graduation party. No melting. Perfect for picnics! Mmm..those buckeye brownies look delicuos..thanku for recipe..please send more..
Keep thise those recipes coming! Yum! These look delicious. I’m going to try them. Thank you. wondering if I can use a cake mix instead of brownie mix ! I change the fillings…add cream de menth,cherry, or orange flavoring…only I make scratch brownies with a can of Hershey’s …the bomb. Yummmm! These look amazing! I can’t wait to try them and see the smiles on my kiddos faces when they munch them up! PINNED! 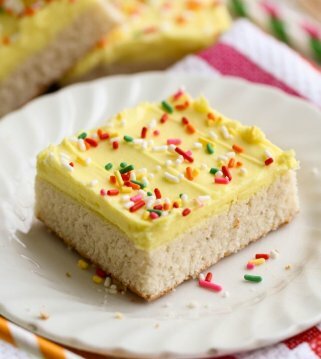 I have made these for my family twice (so far..) and they are fantastic! My question is, has anyone ever tried freezing them? My sons and their families are coming for several days over thanksgiving and I’m trying to do as much in advance as possible, and these brownies are a MUST HAVE! And thank you for the wonderful recipe! Hmmm, I always cut my brownies with a plastic knife because it doesn’t gunk up on the knife and make it messy. Did you try that? Oh my so will be making buckeye brownies found u from a friend on fb where can I sign up to make sure I see your great recipes? I really thought this wasa real recipe. Sad to see it’s another boxed “creation”. I’m sure it’s good, but rather make from scratch. I have made these brownies twice. I decided to alter the recipe a little. I only used 1 and1/2:cup of powered sugar. I also used more peanut butter I used 1 and 3/4 of peanut butter. For the chocolate topping I used the.whole package of chocolate chips. I was very happy with the results. Haha..can’t go wrong with a whole bag of chocolate chips!! Thanks for letting me know! I don’t do mixes, but will try this with homemade brownies. We prefer dark chocolate, so will use semi-sweet chips. I am sure it will be tasty! They are!!! Thanks for stopping by! Yummy!!! A dear friend nicknamed these brownies “crack” because they are so delicious! LOL!!! They are delicious! Thanks so much for stopping by! 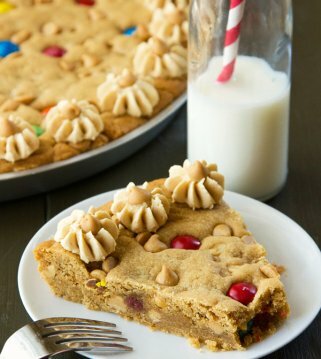 I made these tonight for an after church get-together- can’t wait to try!!! Do they need to be refrigerated? Thank you!!! These were a huge hit thank you! Mine turned out more fudge-like than brownie. I did cut the powdered sugar to 1.5 cups instead of 2 which did make it a little more work to spread but worth it- and cut down the butter by 3-4 T all together (a little from the Peanut butter mix and a little from the topping). I would describe this as delicious but extremely rich- next time will cut into smaller pieces. Thank you! Will definitely be making again!!! I am so glad they were a hit! We love these! I’m sorry I didn’t get back to you sooner! These are a family favorite. So many yummy layers!! Made these , they turned out great!! They are 🙂 Hope you like them! These are bomb dot com!!! Everyone gobbled them up fast. 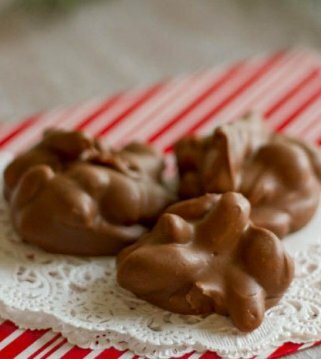 I’ll Make a double batch for christmas. ? LOL..that makes me happy to hear! Thank you so much for letting me know! WoUld it be ok of I used semisweet chicolate chips? This is currently All i have in my pantry…. Yes, of course 🙂 Enjoy! !